Your HVAC system is the heart of comfort and health in your McKinney, Texas, home. As long as the system is working as it should, it can even be easy to forget. But the second something goes wrong, you start losing money to higher utilities, repairs, and more. To save as much money as possible, keep your eyes, ears, and nose open for these indicators of HVAC problems. The last thing you need is to enter your home to the sound of a malfunctioning air conditioner. Out-of-the-ordinary sounds and smells are often indicators of an immediate and even potentially dangerous problem with your HVAC unit. A banging sound could indicate a loose or broken component that’s knocking into other pieces of the system. A screeching sound may be a worn or loose belt. A smell like rotten eggs may be a natural gas leak. If you ever notice a strange sound or smell coming from your HVAC system, call your technician immediately. If the problem seems bad enough, turn off the system as well. Neglecting to call for help can only add more damage to your system. One less noticeable sign of a potential HVAC problem is a drop in energy efficiency. Some homeowners notice this when their HVAC system seems incapable of maintaining comfort. Others notice it when they see spikes in their utility costs, and can’t find any other explanation for the rise in price. Energy efficiency can drop for a number of reasons. Without regular maintenance, an HVAC system’s energy efficiency will fall over time. You may also be losing energy efficiency due to a broken component somewhere in the system. You’ll also experience a drop in energy efficiency if your heating and cooling system isn’t properly sized to the needs of your home. Once again, calling a licensed HVAC technician will help you nail down the specific cause of the energy loss. 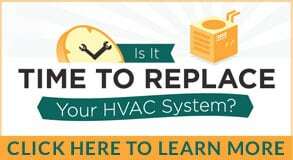 The sooner you catch these HVAC problems, the better. Let our team at Bill Joplin’s Air Conditioning and Heating provide your system with professional maintenance; call us at 888-414-4655.